In February of 2005 I attended a Jens Lekman show at the University of Pittsburgh. Along with me were my soon-to-be-wife, my younger sister and her soon-to-be-fiance, and my youngest sister and her soon-to-be-ex. 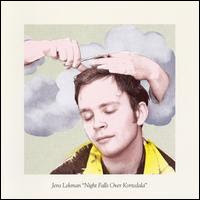 Lekman's music perfectly mirrors these bittersweet possibilities of love beginning as well as coming to a close. With lines like "If I had to choose a moment in time to take with me into eternity/I would choose this moment with you in my arms," he certainly believes in the notion of a true love. In fact, at times you can practically hear his heart overflowing with the wonder of it all. Through all of this open armed sincerity, he isn't afraid to acknowledge the difficulties love presents. However even a song titled "I'm Leaving You Because I Don't Love You" can't help but show its sweeter side by ending with an apology, "I'm so sorry I couldn't love you enough/I'm so sorry." Musically Lekman incorporates influences across the pop spectrum and blends them with his flat baritone and creative sampling. "Sipping On the Sweet Nectar" is straight up disco that would fit right in with those other Swedes. The driving stomp of "The Opposite of Hallelujah" sounds like a Motown single from some alternate universe. "Shirin" is a simple love letter to an under the table hairdresser with a truly transcendental falsetto chorus. "A Postcard to Nina" incorporates doo-wop backing vocals and toy xylophone chimes behind Lekman's tale of playing boyfriend for the overbearing family of a lesbian friend. His wry sense of humor and keen slice of life observations are fully let loose when he sings, "Your father's mailing me all the time/He says he just wants to say Hi/I send back Out of Office - Auto Replies." Its easy to get caught up in Lekman's sentimentality, but that's missing the point. This is simply gorgeous pop music.